The title of this post comes from a song in “Funny Face,” one of my favorite Audrey Hepburn movies. In this movie, Audrey is discovered by a big name fashion magazine editor and is taken to Paris to become a model. When they first land in the city, Audrey, Fred Astaire, and the magazine editor visit several famous sites from the Eiffel Tower to the Latin Quarter while singing, “Bonjour, Paris!” – which was my inspiration for this Parisian itinerary. This day was mostly a travel day for us. We really only had time to do one sight and have dinner after checking in. 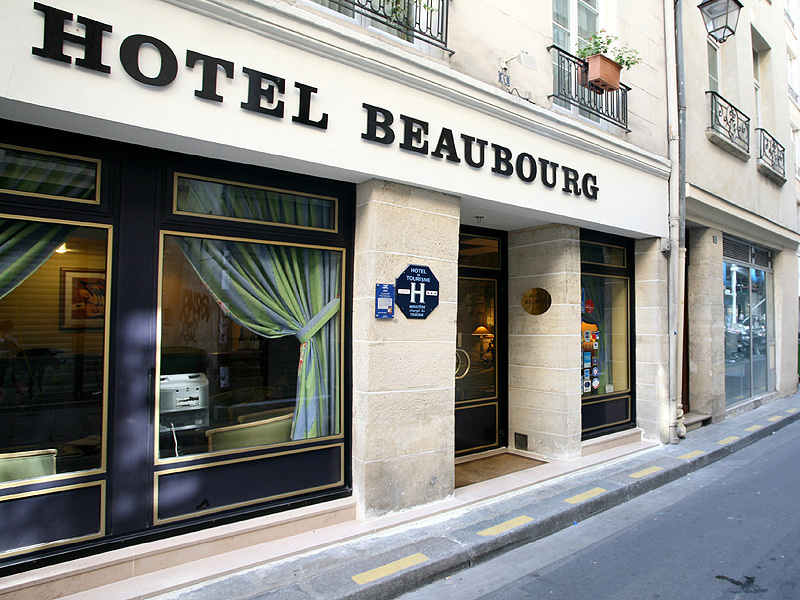 We had previously stayed in vacation apartment retails in both Rome and Barcelona, but we decided to end our trip at a cute 3-star Parisian hotel, Hotel Beaubourg, in the 2nd arrondissement. It was in such a convenient location. Just moments away from Notre Dame and the Louvre. It’s close to a grocery store, a bakery, and several meat and cheese shops too. The only thing this place lacked was a complimentary breakfast. Their breakfast was at around 9 euro per person. I pre-purchased tickets to the Eiffel Tower for a 6pm entrance time so K and I could bypass the ticket line. Thank God I did because it was about 20°F and I could not wait outside in a line an hour long. We eventually spent that hour in another line for the elevator to get to the top of the tower. I chose 6pm because I wanted to catch the sunset from the summit, and luckily, we made it just in time. It was amazing. Watching the large orange sun sink behind the city of Paris was breathtaking. I did kind of have to fight my way to the front of the window as the sun was going down, but once I stopped and actually looked at the view, I immersed myself in the experience. 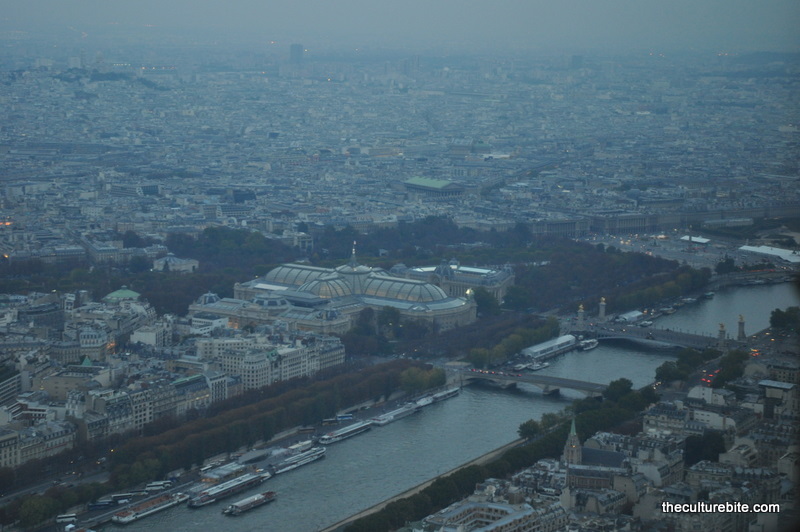 I was at the top of the Eiffel Tower watching a sun set over Paris in a cloudless sky. How many people get to experience that? Well, I’m sure many, but now I am one of them. The one Cliffbar I had during the day wore out about 4 hours before, so I was ready for dinner. On our way to the closest restaurant we could find, the Eiffel Tower began twinkling! Just like a Christmas tree! 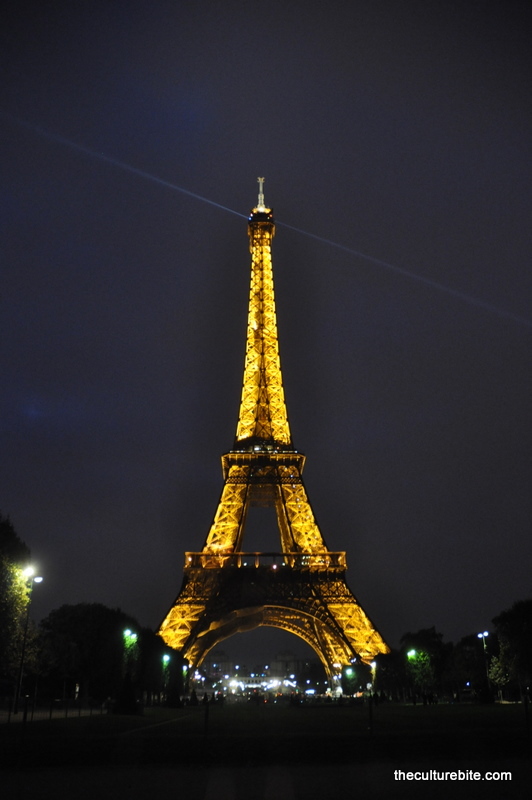 Every night at 9pm the Eiffel Tower twinkles for about 10 minutes. The picture above is not of a twinkling Eiffel Tower. 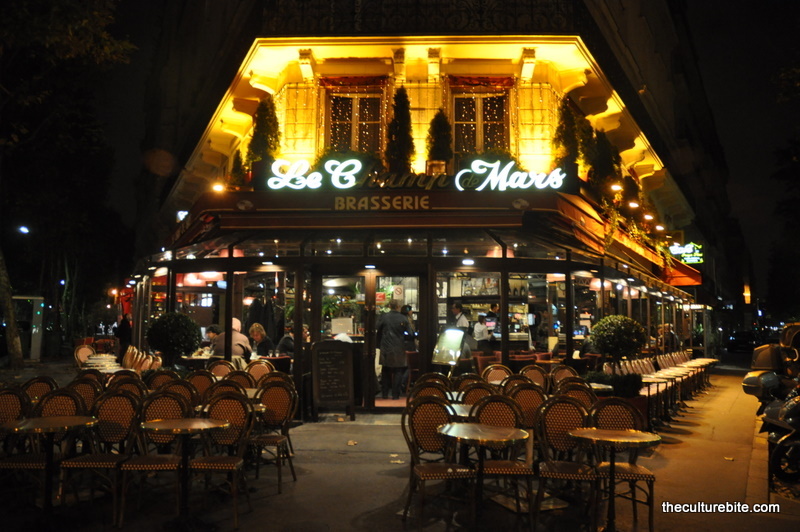 The first restaurant we found was Le Champ de Mars Brasserie, a cute little French cafe at the bottom of the Eiffel Tower. Since it was my first authentic French meal, I went all out. I ordered coq au vin (chicken cooked in wine) with the French onion soup to start. 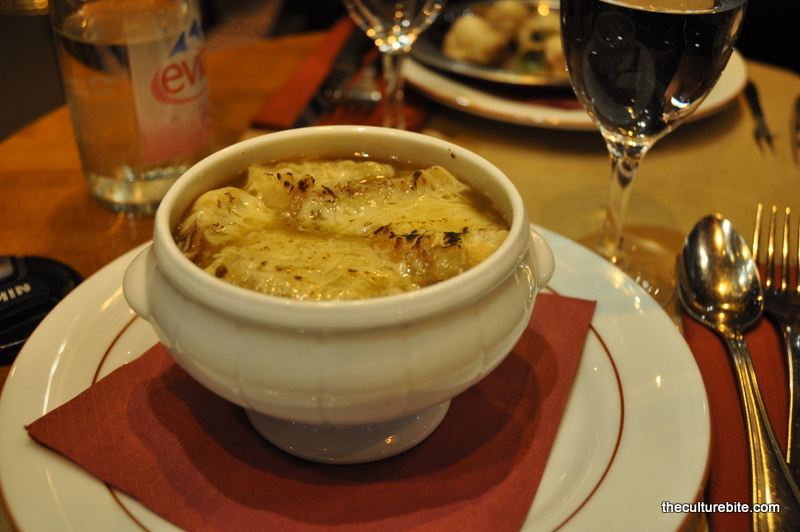 Parisians actually don’t drink French onion soup, but I wanted it anyway. The chicken was amazing. So tender and juicy, the meat fell off the bone. The fettuccine served with was naked. No sauce at all. That’s because you’re supposed to use the wine reduction sauce from the chicken to wet the noodles. Oh mannn, so good. French onion soup can often be salty, but it wasn’t the case for this one. You could actually taste the onions and the crusty cheese on top. K got the steak frites and the escargot. He was a happy camper because he never gets to eat snails (I don’t like them). 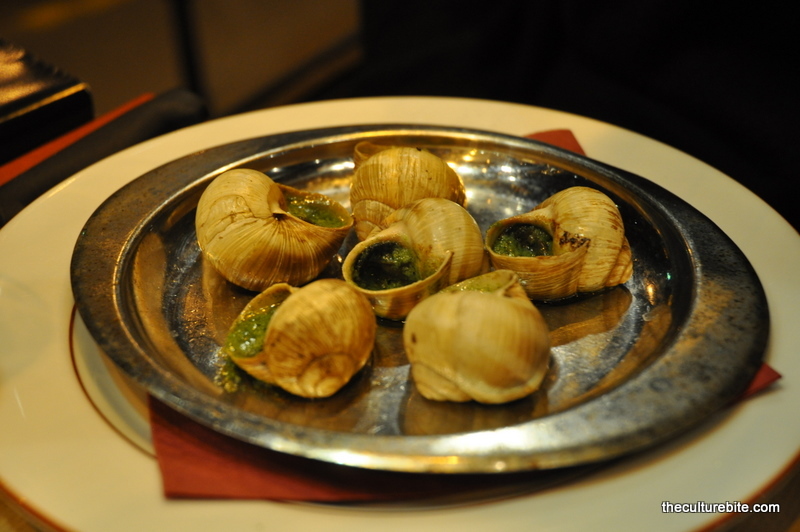 The snails were swimming in a butter, garlic and parsley sauce, but for some reason, K was a little unsatisfied. After his first bite, he mentioned he actually preferred the Chinese snails over this. His steak, however, was a winner. Beautifully charred and seasoned, the medium rare steak was tender and juicy. 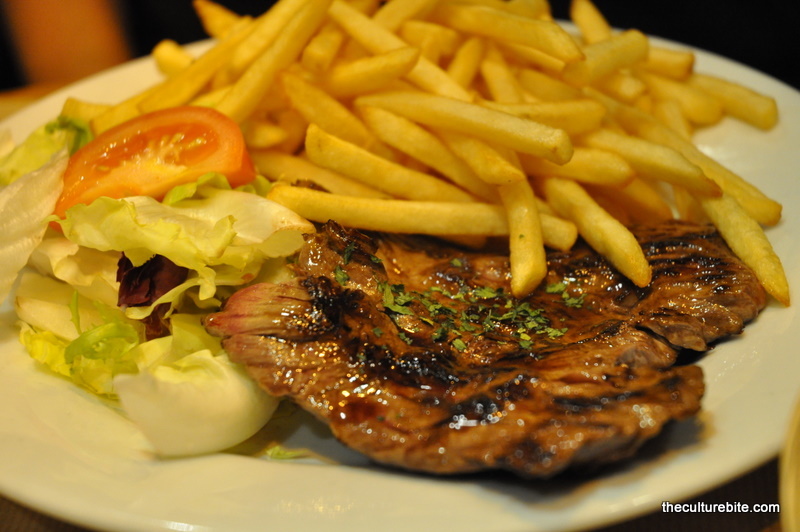 Rick Steves says that Parisian steaks are a little more rare than what Americans are used to. Tip: order medium if you want medium rare. 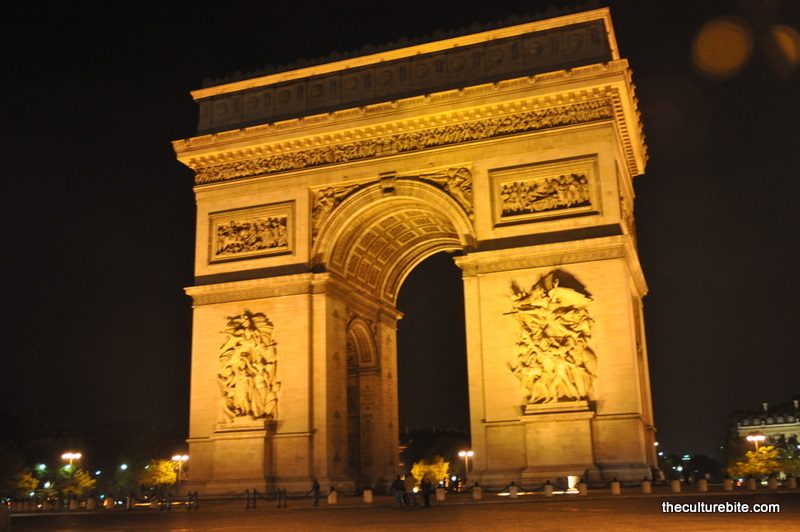 After dinner, we headed for the Champs-Élysées, Paris’ famous shopping street, to see the Arc De Triomphe. It was about 11pm at this time, and the street was still filled with people. Thank goodness we made our way here because we found an H&M that seemed to be open 24 hours. Did I mention it was about 20°F? We stocked up on gloves and scarves to keep us warm. 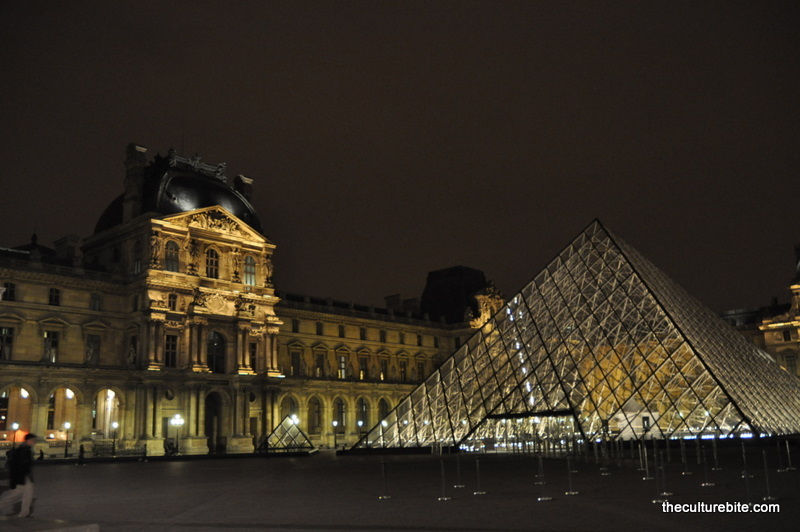 We trekked back home by foot and stopped at the Lourve for a night time photo op. Gosh it was beautiful. The white lights shining through the glass pyramids lit up the museum square. We finally made it home and called it a night for our next full day of Parisian fun.